Board of Regents Chair Matt Fleury, left, and President Mark Ojakian at a board meeting Friday. The governing board of Connecticut’s 12 community colleges is not giving up on implementing a controversial plan to merge the schools into a single accredited institution, even though a regional accrediting body rejected its current pitch. Mark Ojakian, the college system’s president, backpedaled Friday on previous comments that he was considering closing one or more campuses and further raising tuition after The New England Association of Schools and Colleges (NEASC) disapproved his plan. NEASC accreditation is critical because it serves as a guarantee of the academic worth of the colleges’ program and is essential for making students eligible for federal aid. Ojakian and Board of Regents Chair Matt Fleury expressed a willingness to work with NEASC to carry out a modified version of the consolidation plan, which is meant to save a projected $28 million in the face of declining enrollment and reductions in state funding. But college officials project that, even if those savings are achieved, the system will be in the black only for the next two fiscal years before heading back into deficit. The plan would shed 200 administrative positions and align curricula for more than 200 degree programs at the 12 community colleges. NEASC Chairman David P. Angel wrote to Ojakian last week that the commission didn’t believe the plan was realistic. Faculty and students have raised concerns about campuses losing their autonomy, personal fabric and community connections, and that student services would suffer. They also have criticized the plan for creating more difficulty securing scholarships and financial aid. 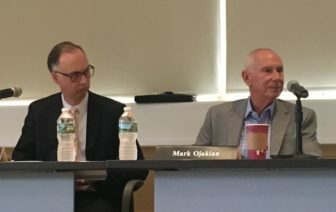 Board member Elease E. Wright said there seems to be a disconnect from the guidance NEASC gave the board to when it made its decision denying the plan. The college system’s president said there needs to be a more transparent process and communication with the commission moving forward. Ojakian said he would provide the board with more details about an amended proposal at the next meeting on May 10. Students on campus at Tunxis Community College in Farmington.